Of all the artists of the Batignolles group in the year 1860, Claude Monet was considered the « maître ». While Monet began his career painting seascapes and large studies of figures, devoting himself mainly to landscape, he grew to love painting the city of Paris. After returning to Paris in 1871 following the Franco-Prussian war, Monet moved into an apartment near the Gare Saint-Lazare on rue de l’Isly, as he was still taking frequent trips by train to Argenteuil and the environs Bougival, and Pontoise. One of the first works Monet painted after moving to Paris was La Gare d’Argenteuil in 1872. In this painting, Monet portrayed a large open space where the locomotives have just pulled into the station, under a bright sky mingled with clouds and blue gray smoke from the locomotives. Monet asked the conductors to embellish the steam of the locomotives to give this contrasting effect in his paintings even though this was not normal protocol for the engines. 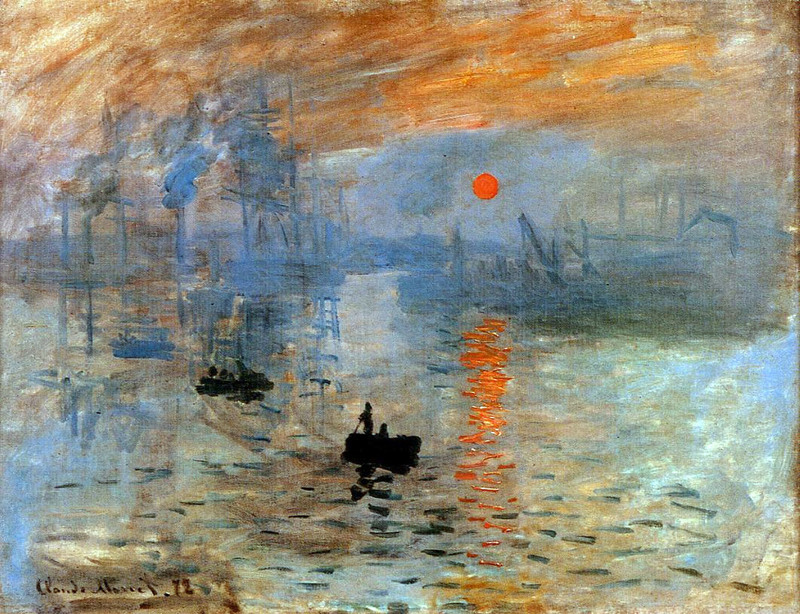 In the Spring of 1874, two grand events mobilized the attention of Monet and his fellow artists, of critics and of the public : the annual Salon where Manet exhibited Le Chemin de fer ; and the first Impressionist exhibition where Monet exhibited Impression, soleil levant (Museé Marmottan-Claude Monet, Paris) , a scene of the port of Havre in northern France. Monet also exhibited Boulevard des Capucines which portrays the newly rebuilt Haussmannian Paris boulevards and architecture. In January of 1877, Monet met with Degas, Sisley, Renoir and Manet at Caillebotte’s home on rue de Miromesnil to discuss showing their paintings in a third Impressionist exhibition. This wonderful event exhibited some of the most famous Impressionist paintings known including Caillebotte’s Le Pont de l’Europe and Rue de Paris ; temps de pluie and over thirty paintings by Monet including twelve of the gare Saint-Lazare. Many art critics today believe that the two great urban scenes by Caillebotte constitute the most important works of the modernity of Paris. Those who know the quartier de l’Europe well appreciate the faithfulness of Caillebotte’s representation and perscpective shown in these two paintings. 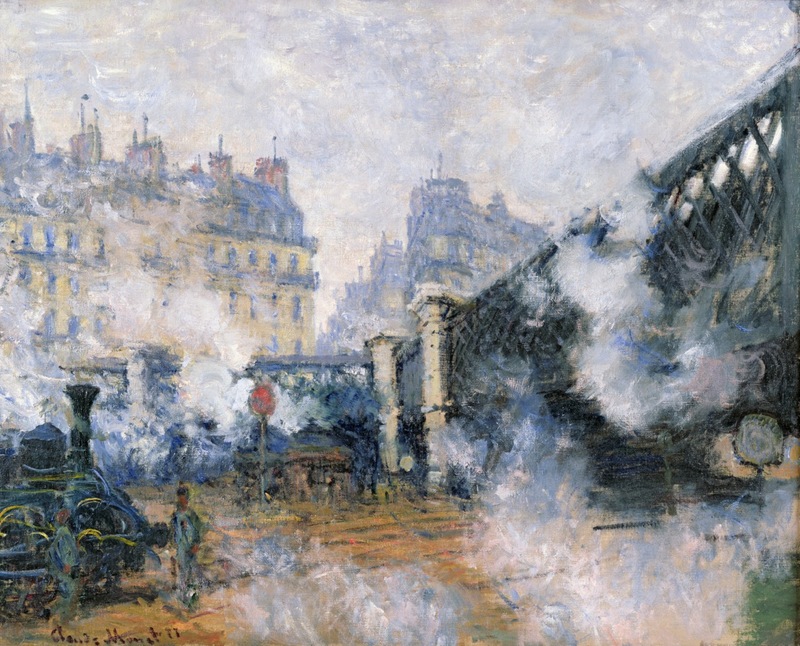 In addition, Monet’s representation of the Gare Saint-Lazare was celebrated in Emile Zola’s article, « les intétieurs de gare superbes ; on y entend le grondement des trains qui s’engouffrent, on y voit des débordements de fumée qui roulent sous les vastes hangars…Là est aujourd’hui la peinture, nos artistes doivent trouver la poésie des gares, comme leurs pères ont trouvé celle des forêts et des fleuves (Le Sémaphore de Marseille, 19 Avril 1877) [ The intétieurs of the beautiful station, you can hear the rumble of the trains that rush in ; we see smoke overflowing, rolling under the large warehouses … Here is today’s painting ; our artists must find poetry in these stations, as their fathers found in forests and rivers]. The Gare Saint-Lazare was finally, the place to catch the train to his beloved Giverny where he would spend the rest of his days painting his gardens and experiencing the Joie de vivre. Thank you! He is one of my favorites. So glad you found my blog so I could find this great article. I always love learning about the artistic history of Paris. Thank you! You are quite welcome! I have found quite a small audience that is interested in the Impressionist’s depiction of the Saint-Lazare. It thrills me to find a fellow erudite of art history!